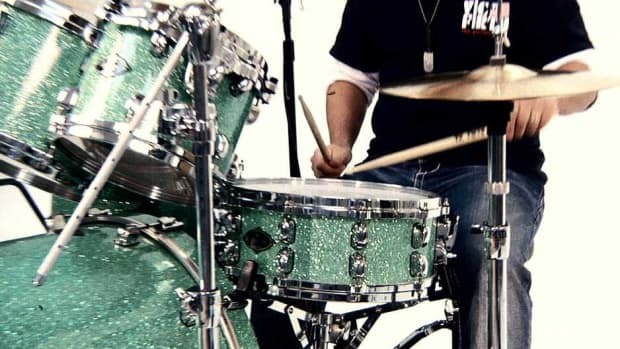 Learn how to play hi-hat variations from drum teacher Jason Gianni in this Howcast drum video. I&apos;d like to talk a little bit about hi-hat variations in a normal rock groove. Now, just like bass drum variations and snare drum variations, there&apos;s so many different variations you can come up with this. But I&apos;m going to just show you a couple different approaches you can take. Now, when we talk about open hi-hat variations, we&apos;re talking about lifting the toe portion of your hi-hat foot off the pedal or up to create the hi-hat to open up as you strike it. Now, what I&apos;m going to do here is I&apos;m going to play a normal rock beat, bass drum on one and three, snare drum on two and four, eighth notes in our right hand or our hi-hat hand. One and two and three and four and. And on the last and of the measure, on the and of four, I&apos;m going to lift my toe up to create an open hi-hat stroke and then bring it back down on the downbeat of beat one. It&apos;s going to sound something like this. One, two, three, four. With open hi-hat variations, you can place them all different points of the measure, on different ands, on even partials of sixteenth notes to create many variations. Another step you can take is to actually just change your hi-hat pattern altogether. Instead of playing eighth notes or downbeats, we could just play upbeats. And what I mean by upbeats is just the ands of the measure. One and two and three and four and. And that&apos;s going to create a totally different feel to your groove. It will sound like this. One, two, three, four. Another way to vary your hi-hat patterns is to add partials of sixteenth notes into your hi-hat hand. So on this pattern, I&apos;m going to add a sixteenth note at the end of the measure. One and two and three and four and uh. One and two and three and four and uh. It will sound like this. One, two, three, four. So if you want to get adventurous, you could take a pattern like that and play that in your hi-hat hand for the entire measure. And what you would get is something like one and uh, two and uh, three and uh, four and uh on the hi-hat over the top of your normal rock beat. It&apos;ll sound like this. One, two, three, four. So remember, as with bass drum and snare drum variations, there are so many ways you can vary your hi-hat. But start with some of those ideas, and see what you can come up with.